DEHB çocukluk çağında %5-7 sıklıkta görülen ve tedavi edilmediğinde psikiyatrik, akademik ve sosyal sorunlara yol açabilen nörobiyolojik bir bozukluktur. DEHB üzerinde oldukça fazla çalışma yapılmış bozukluklardan biri olmasına karşın DEHB ile oldukça yakın ilişkili olan saldırganlığın ihmal edilmiş olduğu görünmektedir. Oysa saldırganlık, DEHB’ye hem sık olarak eşlik etmekte hem de prognoz üzerinde son derece önemli bir faktör olarak görünmektedir. Bu çalışmanın amacı, DEHB ve saldırganlıkla ilişkili çalışmaları derlemektir. Çalışma kapsamında çeşitli veri tabanlarından “Dikkat Eksikliği Hiperaktivite Bozukluğu (DEHB)”, “saldırganlık” anahtar kelimeleri kullanılarak ulaşılabilen çalışmalar gözden geçirilmiştir. Bazı çalışmalar DEHB ile yüksek düzeyde komorbidite gösteren Davranım Bozukluğu (DB) ve Karşıt Olma Karşı Gelme Bozukluğu’nun (KOB) DEHB’de saldırganlığın nedeni olduğunu öne sürmekle birlikte literatürdeki genel eğilim DEHB’nin KOB ve DB’den bağımsız olarak saldırganlıkla ilişkili olduğunu göstermektedir. DEHB’nin doğal gidişini aydınlatmada kritik bir önemi olan uzun izlem çalışmaları da saldırganlığın varlığının DEHB’de çok önemli bir faktör olduğunu ortaya koymaktadır. Bu gözden geçirme yazısında DEHB ve saldırganlık ilişkisinin nedeni, önemi, DEHB ile eşlik eden KOB ve DB olması durumunda saldırganlık şeklindeki farklılıklar ve DEHB ile birlikte saldırganlık varlığında klinik uygulama için öneriler ele alınmıştır. Amerikan Psikiyatri Birliği. (2000). DSM-IV-TR tanı ölçütleri: başvuru elkitabı (2. baskı). (Çev. Ertuğrul Köroğlu). Ankara: Hekimler Yayın Birliği. Amerikan Psikiyatri Birliği. (2013). DSM - 5: Ruhsal bozuklukların tanısal ve sayımsal elkitabı. (Çev. Ertuğrul Köroğlu). Ankara: Hekimler Yayın Birliği. Arseneault L, Moffit TE, Caspi A ve ark. (2003). Strong genetic effects on cross-situational antisocial teachers, examiner-observers, and twins’ self-reports. J Child Psychol Psychiatry, 44, 832–848. August, G. J., Stewart, M. A., & Holmes, C. S. (1983). A four-year follow-up of hyperactive boys with and without conduct disorder. The British Journal of Psychiatry, 143(2), 192-198. Bandura A (2001) Social cognitive theory: an agentic perspective. Ann Rev Psychol, 52, 1-26. Bandura A (1983). Psychological mechanisms of aggression. aggression: theoretical and empirical reviews içinde rs geen ve e donnerstein. (ed) Academic Press, New York, 11-40. Bandura A, Walters, R. H. (1963). Social learning and personality development. Holt: Rinehart & Winston. Barkley RA (2010) Deficient emotional selfregulation: a core component of attention deficit/hyperactivity disorder. JARD, 1, 5¬¬-37. Barkley, R. A., DuPaul, G. J., & McMurray, M. B. (1990). Comprehensive evaluation of attention deficit disorder with and without hyperactivity as defined by research criteria. Journal of consulting and clinical psychology, 58 (6), 775. Baron RA, Richardson DR (1994). Human aggression (2. ed.). New York: Plenum. Berkowitz L (1993). Pain and aggression:some findings and implications. Motiv Emot, 17, 277-93. Burger JM (2006) Kişilik. (Çev. İD Sarıoğlu). İstanbul: Kaknüs Yayınları. Bushman BJ, Anderson CA (2001). Is it time to pull the plug on the hostile versus instru-mental aggression dichotomy? Psychol Rev, 108, 273-79. Connor, D. F., Edwards, G., Fletcher, K. E., Baird, J., Barkley, R. A., & Steingard, R. J. (2003). Correlates of comorbid psychopathology in children with ADHD. Journal of the American Academy of Child & Adolescent Psychiatry, 42 (2), 193-200. Coy K, Speltz ML, DeKlyen M ve ark. (2001). Social-cognitive processes in preschool boys with and without oppositional defiant disorder. J Abnorm Child Psychol, 29, 107-119. Crains R (1979). Social development: The origins and plasticity and interchanges. San Francisco: Freeman. Dionne G, Tremblay RE, Boivin M, ve ark. (2003). Physical aggression and expressive vocabulary in 19 month old twins. Dev Psychol, 39, 261-273. Dodge KA, Lochman JE, Harnish JD ve ark. (1997). Reactive and proactive aggression in school children and psychiatrically impaired chronically assaultive youth. J Ab-norm Psychol, 106, 37-51. Dodge KA (1993). Social-cognitive mechanisms in the development of conduct disorder and depression. Annu Rev Psychol, 44, 559-84. Dodge KA, Frame CL (1982). Social cognitive biases and deficits in aggressive boys. Child Dev, 53, 620–635. Ercan ES, Aydın C (2014). Anne-baba ve eğitimciler için dikkat eksikliği hiperaktivite bozukluğu. Pupa Yayınevi. Ercan ES, Kandulu R, Uslu E ve ark. (2013). Prevalence and diagnostic stability of ADHD and ODD in Turkish children: a 4-year longitudinal study. CAPMH, 7, 30. Eron L (1987) The development of aggressive behavior from the perspective of a develo-ping behaviorism. Am Psychol, 42, 435-442. Farrington DP (1991) Antisocial personality from childhood to adulthood. The Psychologist, 389-394. Fischer, M., Barkley, R. A., Smallish, L., & Fletcher, K. (2002). Young adult follow-up of hyperactive children: self-reported psychiatric disorders, comorbidity, and the role of childhood conduct problems and teen CD. Journal of abnormal child psycho-logy, 30 (5), 463-475. Geen G (2001) Human aggression (2. Ed.). Philadelphia, USA: Open University Press. Haapasalo J, Tremblay RE (1994). Physically aggressive boys from ages 6 to 12: Family background parenting behavior, and prediction of delinquency. J Consult Clin Psychol, 62, 1044-1052. Halperin JM, Newcorn JH, Kopstein I ve ark. (1997). Serotonin, aggression, and parental psychopathology in children with attention deficit hyperactivity disorder. J Am Acad Child Adolesc Psychiatry, 36,1391-1398. Hechtman, L., Weiss, G., & Perlman, T. (1984). Hyperactives as young adults: Past and current substance abuse and antisocial behavior. American Journal of Orthopsyc-hiatry, 54(3), 415. Harnett NE (1992). Aggression in psychiatrically disordered children and adolescent. Yayınlanmış doktora tezi, University of Maryland. Harpaz-Rotem I, Rosenheck RA (2004). Changes in outpatient psychiatric diagnosis in privately insured children and adolescents from 1995 to 2000. Child Psychiatry Hum Dev, 34, 329-40. Hinshaw SP (1987). On the distinction between attentional deficits/hyperactivity and con-duct problems/aggression in child psychopathology. Psychol Bull, 101, 443-463. Hinshaw, S. P. (2002). Preadolescent girls with attention-deficit/hyperactivity disorder: I. Background characteristics, comorbidity, cognitive and social functioning, and parenting practices. Journal of consulting and clinical psychology, 70 (5), 1086. Holmberg M (1980). The development of social interchange patterns from 12-42 months. Child Developmen, 51, 448-456. Holmes, SE., Slaughter, JR., Kashani, J. (2001). Risk factors in childhood that lead to the development of conduct disorder and antisocial personality disorder. 31, 183-193. Hudziak JJ, Van Beijsterveldt CE, Bartels M ve ark. (2003). Individual differences in aggression:genetic analyses by age, gender, and informant in 3-, 7-, and 10-year-old Dutch twins. Behav Genet, 33, 575-589. Huesmann LR, Guerra NG (1997). Children's normative beliefs about aggression and aggressive behavior. J Pers Soc Psychol. 72, 408-419. Kagen J (1988) Temperamental contributions to social behavior. Am Psychol. 44, 668-674. Kim JE, Hetherington EM, Reiss D (1999). Associations among family relationships, anti-social peers, and adolescents’ externalizing behaviors: Gender and family type differences. Child Dev., 70, 1209-1230. King S, Waschbusch DA (2010). Aggression in children with attention deficit hyperactivity disorder. Expert Rev Neurother, 10, 1581–1594. Köknel Ö (1999). Bireysel ve toplumsal şiddet. İstanbul: Altın Kitaplar. Krug GE, Dahlberg LL, Mercy AJ ve ark. (2002). World Report on Violence and Health. Geneva: WHO publications. Lindsay JJ, Anderson CA (2000). From antecedent conditions to violent actions: a general affective aggression model. Pers Soc Psychol Bull, 26, 533-547. Loeber R, Hay D (1997). Key issues in the development of aggression and violence from childhood to early adulthood. Ann Rev Psychol, 48, 371–410. Loeber R, Wung P, Keenan K ve ark. (1993). Developmental pathways in disruptive child behavior. Dev Psychopathol, 5, 103-133. Loeber R, Dishion T (1983). Early predictors of male delinquency: A review. Psychol Bull, 94, 68-99. Mannuzza, S., Klein, R. G., Bessler, A., Malloy, P., & LaPadula, M. (1993). Adult outcome of hyperactive boys: Educational achievement, occupational rank, and psychiat-ric status. Archives of General Psychiatry, 50 (7), 565-576. Miller C, Miller SR, Trampush J ve ark. (2006). Family and cognitive factors: modeling risk for aggression in children with ADHD. J Am Acad Child Adolesc Psychiatry 3, 355-363. Mischel W (1999). Personality coherence and dispositions in a cognitive-affective personality (CAPS) approach içinde, The Coherence of Personality: Social-Cognitive Bases of Consistency, Variability, and Organization, D Cervone ve Y Shoda (ed.) New York: Guilford, s. 37-60. Mischel W, Shoda Y (1995). A cognitive affective system theory of personality: reconceptualizing situations, dispositions, dynamics, and invariance in personality structu-re. Psychol Rev, 102, 246-68. Mischel W (1973). Toward a cognitive social learning reconceptualization of per-sonality. Psychol Rev, 80, 252-83. Öktem F, Sonuvar B (1993). Dikkat eksikliği tanısı alan çocukların özellikleri. Türk Psikiyatri Dergisi, 4, 267-272. Patterson GR, DeBaryshe BD, Ramsey E (1989). A developmental perspective on antisocial behavior. Am Psychol, 44, 329-335. Polanczyk, GV., Willcutt EG., Salum, GA., Kieling C., Rohde, LA. (2014). ADHD prevalence estimates across three decades: an updated systematic review and meta-regression analysis. International Journal of Epidemiology, 43 (2), 434-442. Ramirez JM, Andreu JM (2006). Aggression, and some related psychological constructs (anger, hostility, and impulsivity)-Some comments from a research project. Neurosci Biobehav Rev. 3, 276-291. Retz W, Rösler M (2009). The relation of ADHD and violent aggression: What can we learn from epidemiological and genetic studies? Int J Law Psychiatry, 32, 235-43. Richman N, Stevenson J, Graham PJ (1982). Pre-school to school: A behavioral study. London: Academic Press. Seidman LJ, Valera EM, Makris N (2005). Structural brain imaging of attention-deficit/hyperactivity disorder. Biol Psychiatry, 57, 1263-1272. Shaw, D. S., Owens, E. B., Giovannelli, J., & Winslow, E. B. (2001). Infant and toddler pathways leading to early externalizing disorders. Journal of the American Aca-demy of Child & Adolescent Psychiatry, 40 (1), 36-43. Soubrie P (1986). Reconciling the role of central serotonin neurons in human and animal behavior. Behav Brain Sci, 9, 319-364. Tahiroğlu YA, Avcı A, Fırat S ve ark. (2005). Dikkat eksikliği hiperaktivite bozukluğu: alt tipleri. Anadolu Psikiyatri Dergisi, 6, 5-10. Taylor, E., Chadwick, O., Heptinstall, E., & Danckaerts, M. (1996). Hyperactivity and con-duct problems as risk factors for adolescent development. Journal of the Ameri-can Academy of Child & Adolescent Psychiatry, 35 (9), 1213-1226. Tremblay R (2000). The development of aggressive behaviour during childhood:What have we learned in the past century? Int J Behav Dev, 24, 129-141. Ulu, E. (2018). Saldırganlık tüm DEHB’li erkek çocuklarında aynı biçimde midir? Kastamonu Eğitim Dergisi. Baskıda. 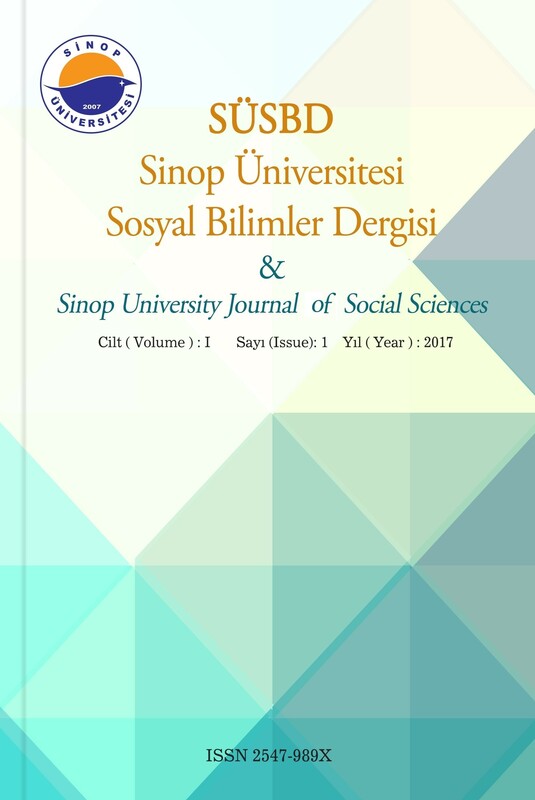 Üngüren, E. (2015). Beynin nöroanatomik ve nörokimyasal yapısının kişilik ve davranış üzerindeki etkisi. Uluslararası Alanya İşletme Fakültesi Dergisi, 7 (1), 193-219. Vaden-Kiernan N, Ialongo NS, Pearson J ve ark. (1995). Household family structure and children's aggressive behavior: A longitudinal study of urban elementary school children. J Abnorm Child Psychol, 23, 553-568. Vance JE, Bowen NK, Fernandez G ve ark. (2002) Risk and protective factors as predictors of outcome in adolescents with psychiatric disorder and aggression. J Am Acad Child Adolesc Psychiatry, 41, 36-43. Yavuzer H (2002). Eğitim ve gelişim özellikleriyle okul çağı çocuğu. Ankara: Remzi Kitabevi. Yalçın, Ö., & Erdoğan, A. (2013). Siddet ve agresyonun nörobiyolojik, psikososyal ve çev-resel nedenleri/neurobiological, psychosocial and enviromental causes of violence and agression. Psikiyatride Guncel Yaklasimlar, 5 (4), 388. Waschbusch DA, Pelham WE, Jennings JR ve ark. (2002). Reactive aggression in boys with disruptive behavior disorders: behavior, physiology, and affect. J Abnorm Child Psychol, 30, 641–656.